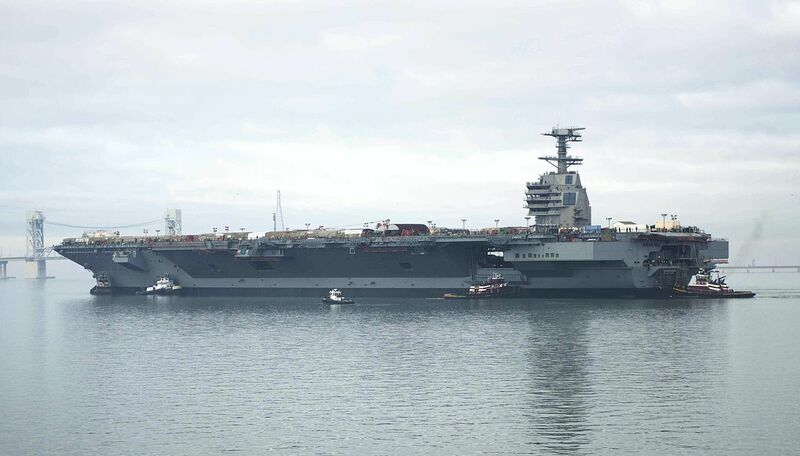 The U.S. Navy has awarded Huntington Ingalls Industries’ Newport News Shipbuilding division a massive $15.2 billion contract for the design and construction of two Ford class aircraft carriers: Enterprise (CVN 80) and CVN 81, which has not been named. The Navy stated that the block buy will save the service $4 billion compared to buying the ships individually. The two ships are the third and fourth in the Ford class, preceded by the USS Gerald R. Ford (CVN 78), commissioned in July 2017, and the future USS John F. Kennedy (CVN 79), now under construction. Construction of CVN 80 actually began in 2017 thanks to advance procurement and fabrication contracts awarded starting in May 2016. The ship, a numerical replacement for USS Eisenhower (CVN 69), will be delivered in 2028. CVN 81, replacing USS Carl Vinson (CVN 70), is slated for delivery in 2032. Newport News Shipbuilding is solely responsible for the design and construction of all nuclear-powered aircraft carriers for the U.S. Navy. The contract includes a number of design modifications needed to integrate the F-35C, Mk 38 self-defense gun system, and MQ-25 Stingray unmanned tanker. The Navy says this portion of the contract represents another $100 million worth of savings in addition to the $4 billion, as these new capabilities were not included in the service’s original single-ship cost estimates. Further, these integration cost savings will double to $200 million if installed prior to the ship being delivered, according to the Navy. The delivery of ship does not mean work has been completed, and it is typical for various onboard systems to be installed post-delivery. Block buys are a standard practice for other types of Navy warships, but the practice has not been used for aircraft carriers since the 1980s, when the Navy purchased the Nimitz class aircraft carriers USS John C. Stennis (CVN 74) and USS Harry S. Truman (CVN 75) and USS Abraham Lincoln (CVN 72) and USS George Washington (CVN 73). The projected savings will be welcomed by Congress, as costs have been a significant concern for the program for some time. Lawmakers have increased the cost cap for the Ford class three times at the behest of the Navy, most recently in the FY18 defense authorization bill. The lead ship is capped at $12.9 billion (in then-year dollars), which is nearly 23 percent higher than the original $10.5 billion cost cap set by Congress in 2007. In May 2018, the Navy reported an additional $120 million in cost growth for CVN 78, bringing the total price to just over $13 billion. The Navy has tried to reduce the costs of CVN 79, and the FY16 defense authorization bill lowered the cost cap for CVN 79 to $11.4 billion. The Congressional Budget Office (CBO) and Government Accountability Office (GAO) have warned that CVN 79 will likely exceed the cost cap. The cap for CVN 80 and follow-on ships was increased to $12.6 billion in the FY18 defense authorization bill. The Navy has said that it plans to conduct independent cost estimates for every ship in the class starting with CVN 80.